Unique, rich deep-purple, almost black colour! 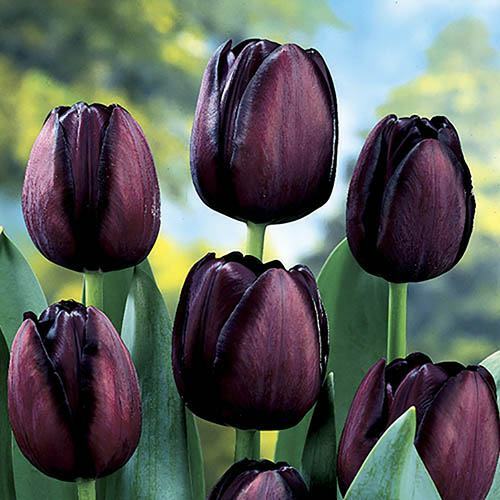 One of the most eye-catching and unique tulips with its deep purple, almost black petals, Tulip 'Queen of the Night' looks great planted with white tulips to contrast with the distinctive dark colour which makes it stand out even more. Tulips are one of the most popular bulbs as they are such an easy spring flower to plant and grow and they look great planted in a mix of different colour variations to give vibrant spring colour to your garden, patio or decking. They also make great cut flowers to use in vases and containers on the windowsill to brighten up the house. Supplied as a pack of size 12+ bulbs, ready for planting.